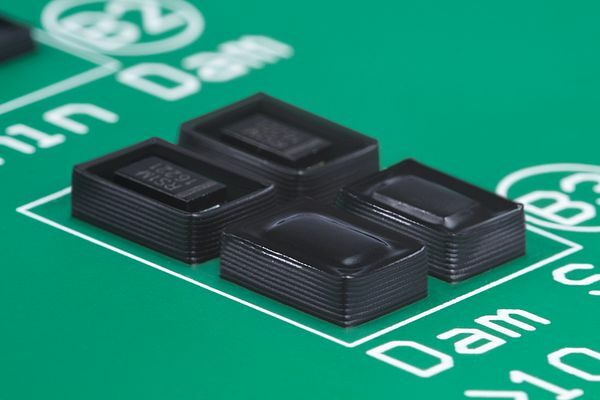 The new adhesive from DELO has smaller fillers than previous products of the company's “dam-and-fill” range, allowing it to be applied with needles of a minimum diameter of 250 µm, which is important given the increasing miniaturization in electronics. Thanks to an exceptionally high viscosity of 160,000 mPas, the adhesive additionally provides high flow resistance and an aspect ratio of 2.5. This means that the height of an adhesive bead can be more than twice its width, without the bead collapsing. These characteristics make the easy-to-handle adhesive perfectly suited for finest structures such as high separating walls between sensors, for example, which require little width. Stacking of bead layers, known as “dam stacking”, is possible without curing in between. In addition to these design options, DELOMONOPOX GE7985 ensures high reliability. Its outstanding properties include an extended service temperature range up to 200 °C, low water absorption, and very good chemical resistance to acids, oils, and other aggressive media. Moreover, the black one-component product has a coefficient of thermal expansion (CTE) of 24 ppm/K, which, combined with the high glass transition temperature of 180 °C, keeps warping at a very low level over a large temperature range, thus minimizing stress to the package. Finally, the new DELOMONOPOX GE7985 features good strength on the FR4 PCB material, reaching a compression shear strength of 49 MPa. This value changes very little even after 500 hours of storing at 200 °C, it is still at 43 MPa. The adhesive cures under heat with variable conditions in terms of time and temperature, for example, 20 minutes at 150 °C or 90 minutes at 125 °C. Thanks to the adhesive's flow resistance, the aspect ratio does not change during this process, so the height of the adhesive bead remains the same after heat curing.